(Reuters) - Cardiff City canceled the club's trip to Tenerife for a mid-season break so the players could mourn striker Emiliano Sala's death with their families, manager Neil Warnock has said. January signing Sala was traveling to Cardiff from French club Nantes when the plane he was on crashed in the English Channel last month. His body was recovered from the wreckage last week while pilot David Ibbotson is yet to be found. The Welsh club are not in action this weekend after getting knocked out of the FA Cup last month and their next match is in the league at home against Watford on Feb. 22, which gave the club time for a warm-weather training camp. 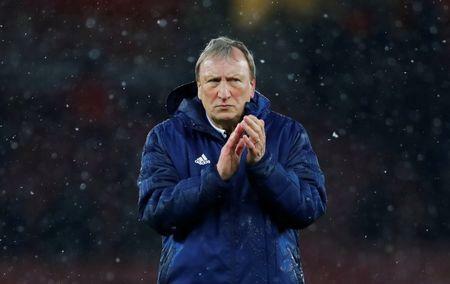 "The club gave me permission to fly out to Tenerife, to take them all for four days but after what's happened over the past two weeks, I'd rather cuddle my kids and see my missus because it's been a long two weeks," Warnock told reporters. "I've never known anything like this in my life and I've seen most things. They'll all be reflecting on what's happened and your family is more important than football isn't it?" Cardiff's 2-1 win at Southampton over the weekend was dedicated to Sala by Warnock and midfielder Aron Gunnarsson said the Argentine striker's death had 'brought everyone together' at the club. "The most important thing was for the family to mourn. Knowing that now, hopefully the pilot will be found and his family can mourn," Gunnarsson said.